Hey everyone. We’re Heather and Fred. We’re a couple of young professionals hailing from the fair city of San Francisco, California; well, we are “originally” from Wisconsin and New York, but we live in San Francisco now. We started dating after meeting each other back in February 2009 at the Grilled Cheese Invitational (SF loves its obscure festivals and competitions). You can imagine the delight that a girl from Wisconsin, America’s Dairy State, would have when she found her beau at a competition for cheese sandwiches. It was fate. Anyways, we’ve both always had a real love for travel. 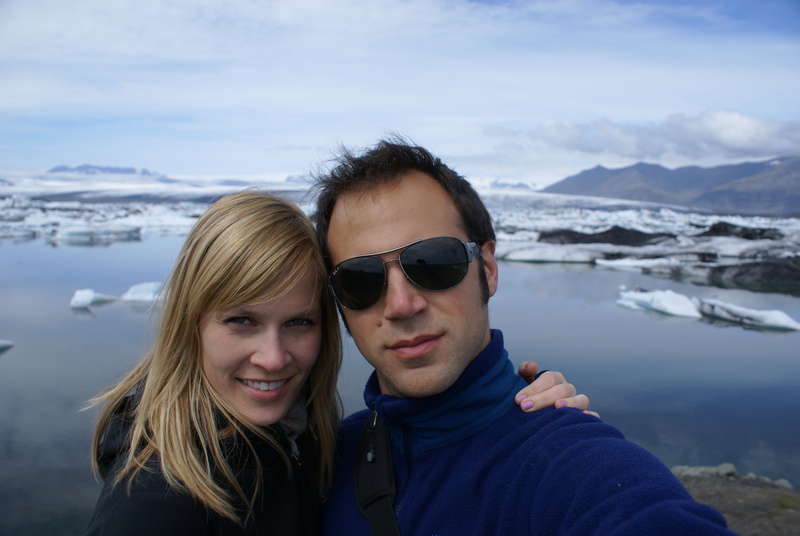 Our first international voyage as a couple was a one-week trip in 2010 to the Land of Fire and Ice, Iceland. It was love. Now with our fires lit to fill up our passports with new customs stamps, we recently decided what better way than to quit our jobs, put all of our belongings in storage, rent out our home, throw a few things in a backpack, and hit the road (er, air). And so it was decided: 2 continents, 13 countries, 6.5 months. We’ll be chronicling our travels as we explore the countries of Argentina, Chile, Uruguay, Brazil, Peru, Thailand, Laos, Cambodia, Vietnam, Nepal, Tibet, India and The Maldives. Check back often. God only knows what awaits. Heather / F.J……….seems like you guys are having a great time, pictures are outstanding. Hope you are pacing yourself, you have a long way to go and you don’t want to run out of gas. Hi guys, That’s a great adventure you are embarking on. I am originally from there and not living in Heather’s homestate(aka Wisconsin). I would love to help you guys when you are in India. If you need any help for location, staying, traveling tip. Feel free to contact me. I would be glad to help. All the best for your journey and I will enjoy it through your blog. Niicee! Can’t wait to read more of your stories as I too plan on going on a 6-12 months South America jaunt! what a fun adventure! 🙂 i’m a little jealous! So jealous of your travel itinerary! It looks amazing. I’ve been to Ushuaia before as a jumping off point to go to Antarctica, it’s a BEAUTIFUL place. I’m a travel junkie as well, just still in school, which gets in the way of my travel plans. I’m excited to read about yall’s (I’m also from TX) journey…especially Cambodia. I’m going there this Summer and super excited about it! I’ll be reading along! (I just stumbled upon the blog on the WordPress homepage). Hey Dags. Thanks for the post. Yeah, things are really good. Having a wonderful time, seeing lots of amazing stuff. Have wanted to do this for a long time so my girlfriend and I finally said lets do it. I can’t believe you guys are pregnant with number 2. That’s amazing. That’s awesome that you were just hanging with Eichenwald. Haven’t seen that guy in probably 10 years. We get back from our trip early September. We are planning to come east. I’d like to make it to the Philly area so hopefully we can connect. Thanks again for reaching out. Talk to you soon. Hey there, from a fellow “cheesehead” also living abroad. Sounds like a great plan. Loved your pics of BA. I had no idea it was that beautiful. Explains why my husband wants to go there. It’s gorgeous. Hey…that’s a great idea! In fact I think there would be few better! When you do eventually swing by India let us know … may be we could point you in some interesting, if not the right, directions! 🙂 Bon voyage! SF Bay Area is where I call home when I’m not traveling… Currently, teaching (assisting) English in South of Spain and enjoying the simpler life! What a beautiful blog with lots of great photos and posts. Enjoy yourselves! Sounds amazing and I sincerely hope (pray) that you both have the best adventures. I can’t wait to do the same myself! I’ll be looking towards your post! Vagan por el hermoso global, buen viaje! I am glad to have come across your blog. We seem share one passions – Travelling. I have two more going on the list – Food and Photography – in either which manner! Amazing!!! My husband Jim and I travel each year too- mostly Europe to date…. Live the dream for us till our opportunity presents itself!! ask for help when hitting peru! Brilliant! You can sit and knit when you’re old but Iceland when you’re all fired up is great. Safe travels and please try and extend that list to include us in Australia – the reef and outback are amazingly colourful. We also have good cheese in Tasmania. Stop by for a sandwich. Cheers. Really cool idea for a blog and an inspiring story! I will be living vicariously through you both by reading about your most excellent adventures! Love this idea and have actually lived it too! happy travels!!! Lovin’ the ambition and that y’all are indeed en route and not still daydreaming about it back in your offices! wishing both of you lots of fun travels!! The trip sounds amazing. India is something else. Enjoy!! I hope one day I have enough courage to do what you guys are doing. I LOVE traveling but I’m not brave enough to just pick up and go like you guys. Keep doing what you are doing and having great adventures. You are inspiring me! You two are adorable! I am so glad I found your blog! I haven’t read past this yet but will start as soon as time allows. My hubs and I have traveled all over SE Asia as well, lived in Okinawa, Japan for 3 years, so I’m excited to see another’s perspective and pictures. Hope you’re both safe, happy and healthy on your travels! Thanks so much for your thoughtful comment. And thanks for checkin out our site! Well we saved up for a long while and finally had the courage to quit our jobs and go for it. It’s been amazing. Thanks for checking out the site. Hey There! It looks like we’re sharing a similar journey. We’re on part 2 of ours. Always nice to run into like-minded peeps! You have a very interesting blog. I’m looking forward to reading through your posts. I plan to travel to some of the countries mentioned in your blogs. This is very inspirational. Hi all the way from Cape Town, South Africa. If you’re in the area, look me up 😉 Enjoy your travels!